I came across a very nice new site today from a new WordPress development shop, The WP Co. 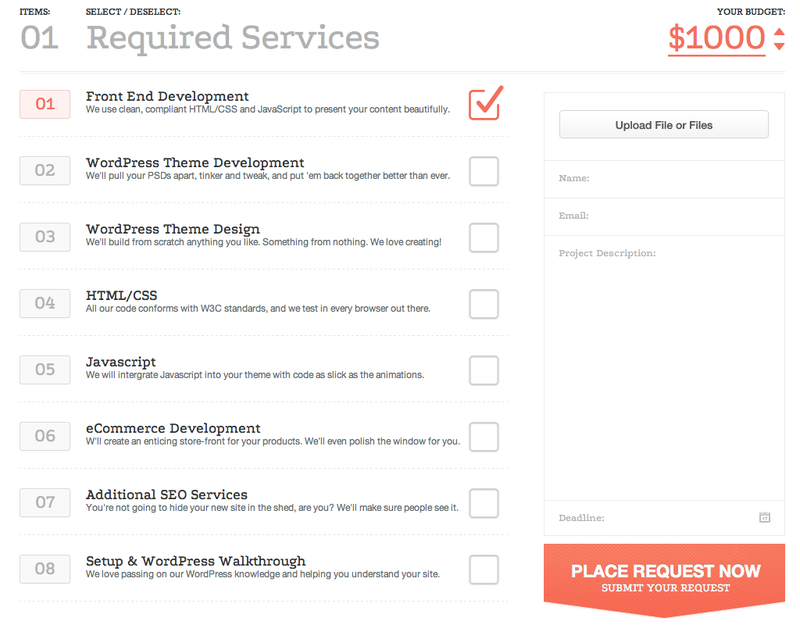 They seem to do custom WordPress design, PSD > WordPress, and plugin development. But that’s not what’s interesting about their site. What’s interesting is their Request a Quote page. Which all seems simple and sensible enough. What he (and I) love about their quote page is that they spell out what’s involved in creating a website for a client. As designers and developers, we almost never actually spell out what’s involved with taking a pile of a client’s ideas and putting them, lovingly and carefully, on the web. If you’ve done it before, you’ll know that it’s a lot work. There’s always this strong reluctance when we give people cost estimates. Maybe we feel like we’re not good enough to command a high price tag, or maybe we feel like if we quote too high then the client will go to someone else for cheaper. I certainly feel the latter all the time, and its really because clients generally have a poor understanding what’s involved in developing a site—through no one’s fault but our own. Obviously we need to be more open and direct about exactly what’s involved in developing a website. We need to spell things out better instead of just wrapping the whole thing up into a magic dollar figure at the bottom of a quote. Postscript: I intend to write more about this soon, but having your code on Github is a great help. By looking at a project’s commit history, a client can see exactly where their money is going. A project with 100+ commits over 2-3 months, for example, is not a small project and hence not well represented by a small, conservative quote.